The ketogenic diet has revolutionized healthy lifestyles, applying a proven, scientific approach to food. But it’s tough to find time to whip up these professionally-tested, balanced foods for every meal. That’s why making all-in-one sheet pan dishes is perfect for those on the ketogenic diet. 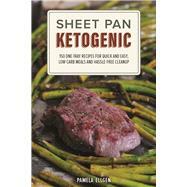 The delicious recipes in Sheet Pan Ketogenic do the math for you. Every recipe is low-carb and made up of 70-75% fat and 15-25% protein, promoting whole, healthy foods and weight loss. More importantly, these mouthwatering low-carb combinations cook together on the sheet pan, enhancing their flavors for a tasty meal with minimal cleanup. Featuring meals like Coffee-Rubbed Prime Rib with Roasted Garlic and Baked Salmon with Honey Mustard Cream Sauce, each recipe offers gourmet combinations that are designed to jump start fat burning. Chapters are arranged by protein source—from lamb to pork to wild fish and plants—and make it easy to build meals around even the pickiest of tastes and dietary concerns. Pamela Ellgen is a food blogger, certified personal trainer, and author of many books on cooking, nutrition, and fitness. Her work has been published in Huffington Post, LIVESTRONG, Darling Magazine, and Spinning.com. Pamela lives in California with her husband and two sons. When she’s not in the kitchen, she enjoys practicing yoga, surfing, and exploring the local farmer’s market.